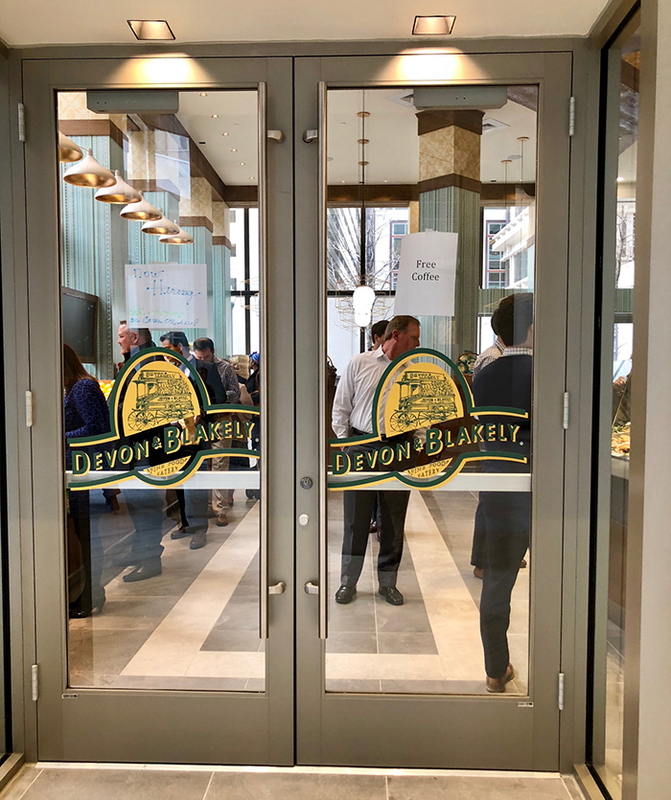 Devon & Blakely, an upscale fast-casual restaurant, is now open in Uptown’s Bank of America Plaza building. 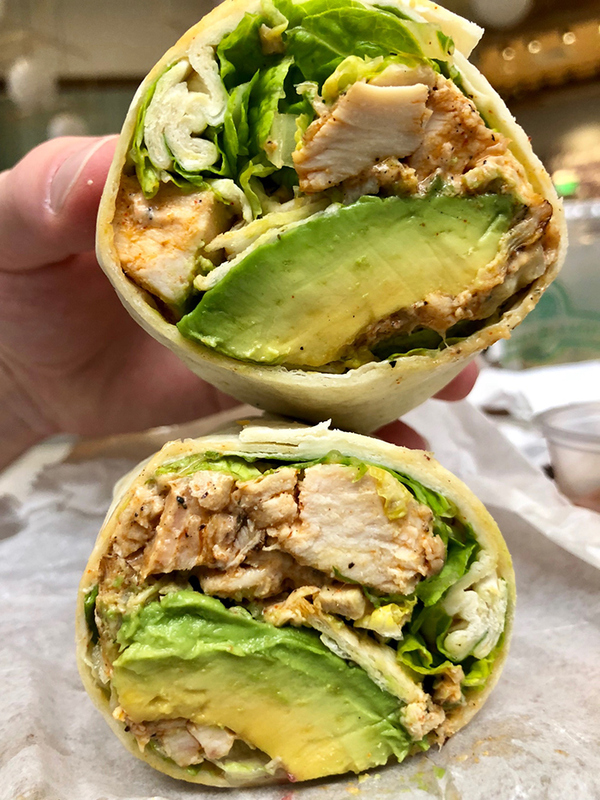 This chain is known for their grab-and-go sandwiches, made-to-order salads and soup selection. 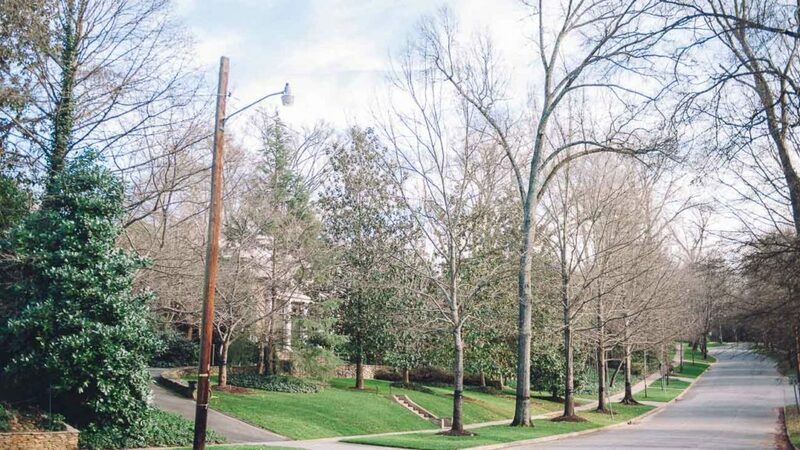 Hours are 6:30 a.m. to 4 p.m. Monday – Friday. They’re closed on the weekend. I’ve been there twice and the food is delicious, but pricey. Here’s what you need to know. (1) How Devon & Blakely works: Choose your station, make your order, grab your items and pay at the cash register area in the front left. After you order, they’ll give you your item and then you take it to the cash register in the front left for checkout. (2) The three most popular sandwiches (all $9.25) are the Blackened Chicken, Pressed Cuban, and Chicken Milanese. 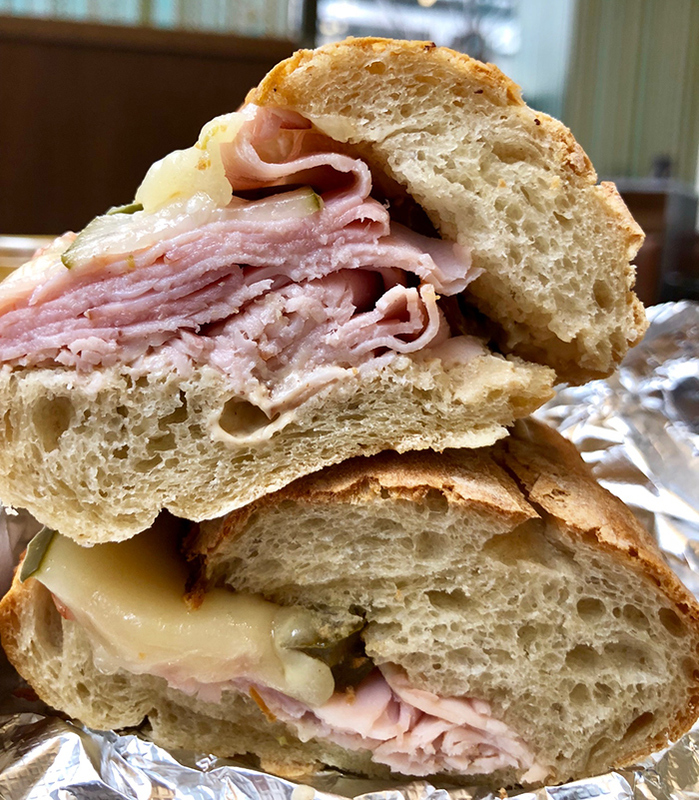 Pressed Cuban ($9.25): cured ham, swiss, jalapeño peppers, pickles, and dijonnaise on French bread. 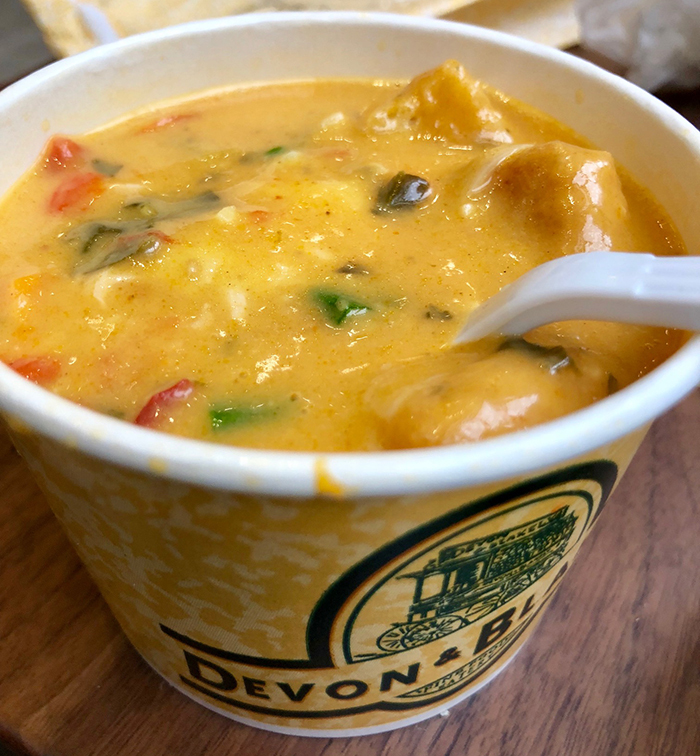 (3) Devon & Blakely offers 18 soups. Yes, 18 soups! 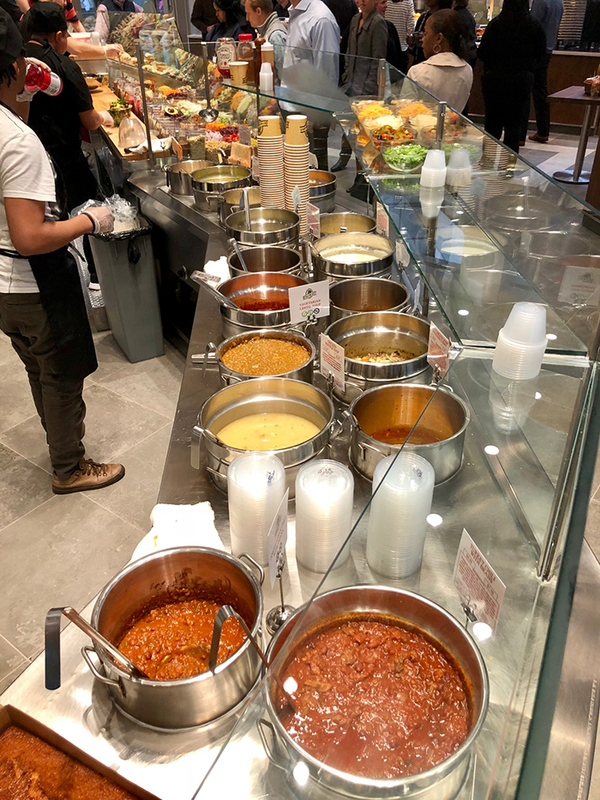 The six most popular soups are Chicken Noodle, Vegetarian Lentil, Chicken Pot Pie, Vegetarian 3 Bean Chili, Angus Beef Chili, Turkey Chili and Homemade Cornbread – these soups are permanently on the menu. The 12 other soups rotate seasonally. 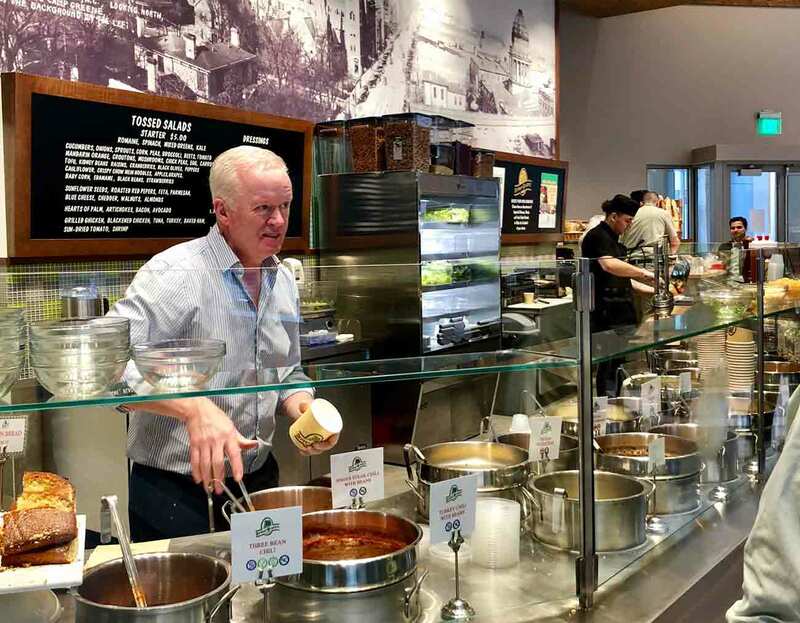 Don’t be shy to ask for a soup sample, the Devon & Blakely staff members working the soup station are very friendly and they give out samples in little plastic cups. Oh, and you can add green onions, cheese, jalapeño and croutons to your soup. Most 12-ounce soups cost $6.50 and 16-ounce soups cost $7.50. I went with the Chicken Coconut Curry soup. Delicious. 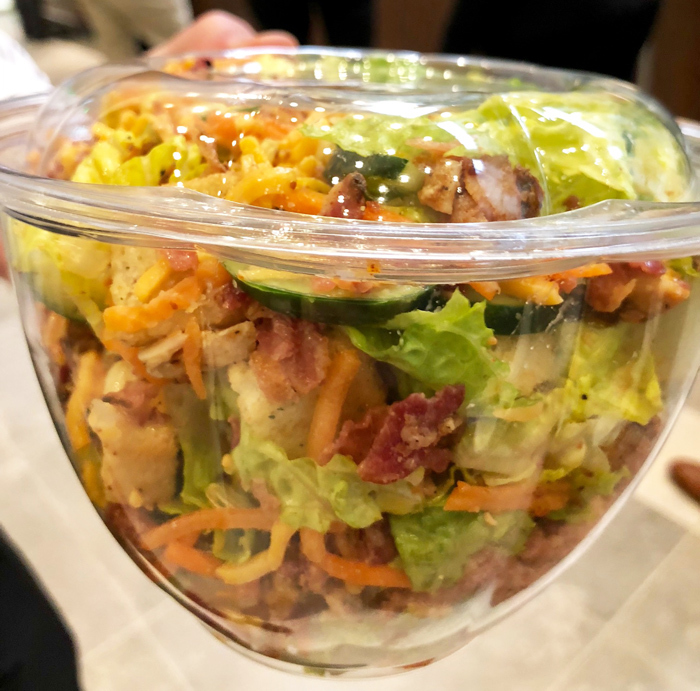 (4) Devon & Blakely salads are fresh and made to order. 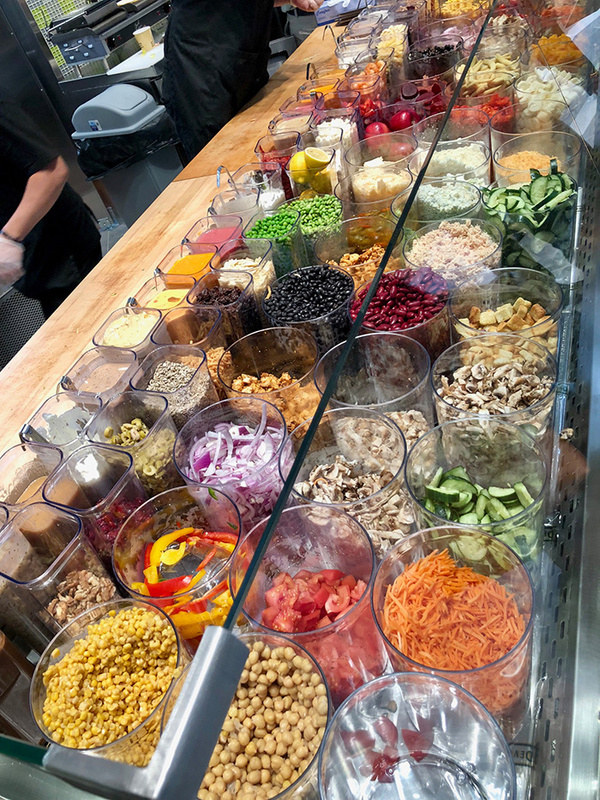 You start with a lettuce base ($5.50), add toppings ($.50 or $.75), add more expensive toppings like avocado ($1.50) and add a meat/fish for ($2.50). 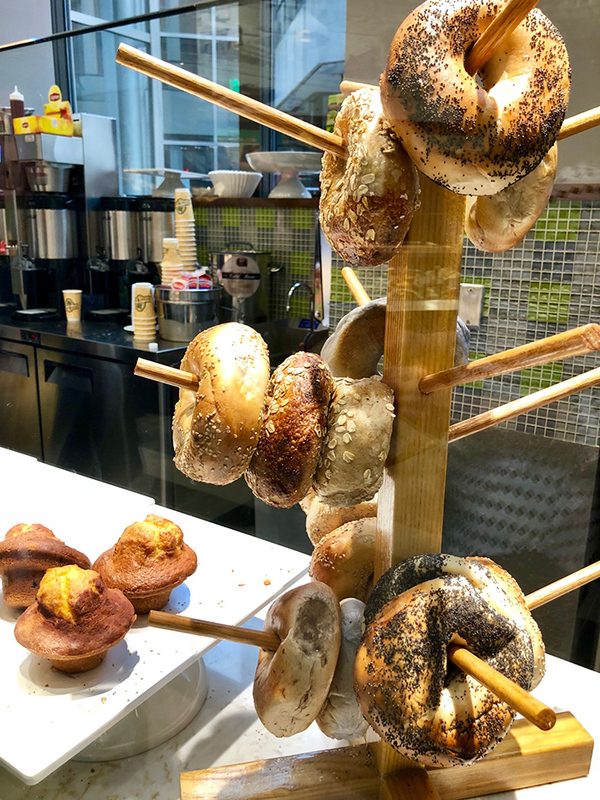 (5) The bagels are thick. (6) Devon & Blakely is a busy banker’s paradise. 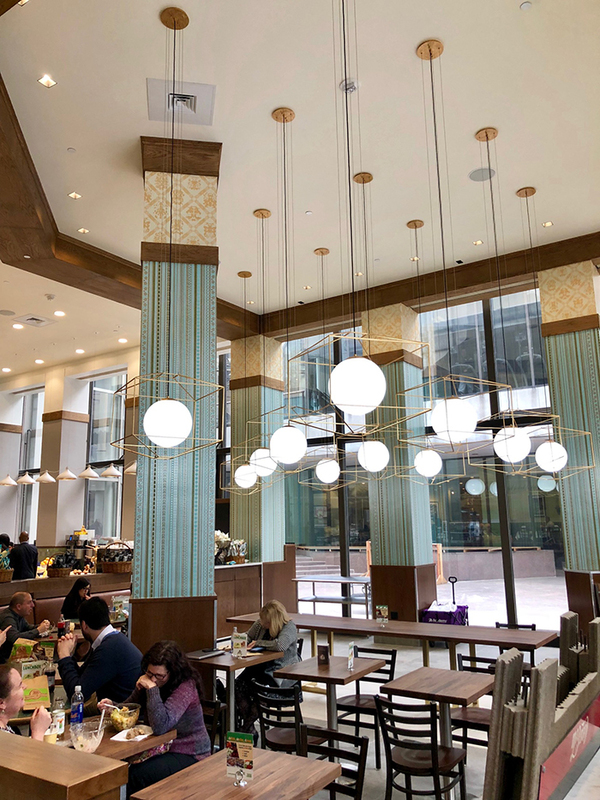 Devon & Blakely’s healthy options, location and fast service means that it’ll quickly become a go-to for the busy Uptown bankers. It’s pricey, but let’s be honest, bankers don’t mind paying a little more for convenience and quality. Random side note: The ceilings are super high and the space looks great. 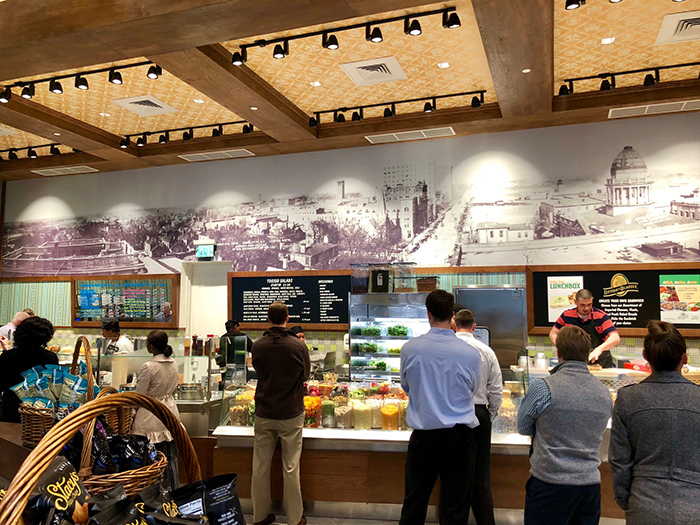 Most guests are grab-and-go, but it’s a nice spot to eat.